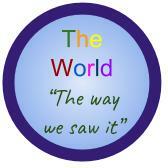 The World "The way we saw it"
Welcome to The World "The way we saw it." This project displays the photography and related text of students from Humboldt State University and Arcata High School. Arcata High School, The World "The way we saw it"
HSU World Languages and Cultures, The World "The way we saw it"
Photographs, Arcata High School, The World "The way we saw it"